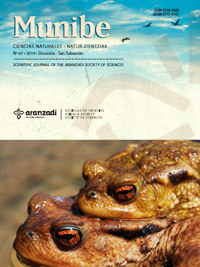 Munibe Ciencias Naturales is the scientific Journal of the Aranzadi Society of Sciences, research center founded in 1947 with the main objective of the investigation, application and spreading of Sciences. Munibe has an annual regularity and publishes original works of investigation sice 1949 connected with the areas of Geology, Botany, Zoology, Ecology and Environmental Studies. Included in the Latindex catalogue and indexed or resumed by Historical Abstracts, ICYT, Zoological Record, Francis, America, History and Life. Munibe Ciencias Naturales is a full open access journal. Web users have the right to read, download, copy, distribute, print, search, or link to the full texts of articles. Munibe Ciencias Naturales does not have either article submission charges or article processing charges (APCs).